Tommy and Stephanie Shoemaker of 4 S Transport in Cleburne, Texas were the first businesspeople to reach out and partner with Father’s House in response to the big changes announced in June. They will never fully realize how powerfully the Lord used their timely response to encourage and assure us. Tommy says: I am not one to seek any kind of recognition, but I do understand the need to let people see how the Lord is working. We went to Israel with Father’s House in December, 2010. We could never repay Father’s House for helping us get there and for the effects of the trip on us spiritually and emotionally. My wife first saw the present needs of Father’s House on their Facebook page. She asked me to look at it because she thought we should be an individual sponsor. Then, when I read it, I found out we could be a business sponsor. We have a trucking company that the Lord continues to bless, and we are grateful for the chance to give back. We serve a great and awesome God! 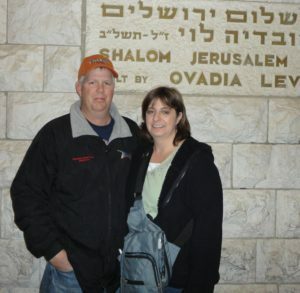 Stephanie adds: I will tell you that I have been in and around the church most of my life, but nothing really prepared me for how real the Bible is until I went to Israel. Don’t get me wrong, I have a great relationship with the Lord, but Israel just brings the Bible to life, and so much more. I hope Father’s House continues to grow and that one day our kids get to go.